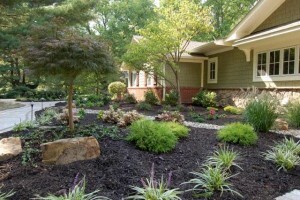 Summertime seems to be the most challenging times of the year to maintain your yard. With the temperatures rising, lawns become “burnt” looking and dry. Plants begin to droop and do not look as perky as they should. The soil becomes dry and it is hard to grow just about anything without some maintenance. If the summer is a hot and humid one, this dryness will continue and you may lose plants, shrubs and flowers you planted. No only will this diminish all of your hard work that you put in from planting, but it will also become an eyesore for you to look at. You may glance over at your neighbors yard and wonder how their landscaping looks so fresh and new. We would like to help you keep your landscaping looking fresh and bright this summer. It is very important to take precautions and maintain a watering schedule once the weather really heats up. This will save the plants, lawn and flowers from irreversible damage. It is essential to maintain any newly planted trees, flowers and shrubs. We know that you may not be an expert landscaper and may not have had to evaluate your lawn and plants before, but there are key signs to notice that dehydration is present. Keeping your plants, trees, flowers and lawn alive are based upon the water consumption of each. If there are periods of drought and you notice any of the above signs, it is best to start a watering schedule. The main thing to consider before starting this is to learn your cities water restrictions. A lot of areas will only allow certain days or hours of watering to occur due to water shortages, you may be fined if you choose to disregard these restrictions. Watering first thing in the morning if this is allowed, seems to be the best result when your plants/trees. If you choose to water in the afternoon, some of the water evaporates and less water is getting into the areas that it needs to. Lawns needs about an inch of water each week, but can survive with about a 1/2 inch as well. Apply 1 gallon of water per 1 foot once a week for plants. Apply water around the base of flowers, vegetables and herb to ensure the roots are being covered. Remember to water before it is too late. The best way to avoid dehydration is to stay on top of the way your landscaping looks and pay attention to the weather. If footprints appear longer on the lawn, you may need to water more often. Grab a handful of soil and squeeze it, if it holds together you have enough water. Mulch prevents weeds from growing vigorously. 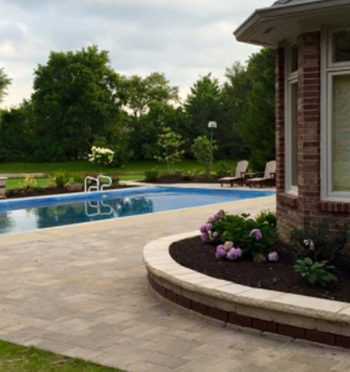 We hope these tips will help you with your landscaping needs for the approaching summer.